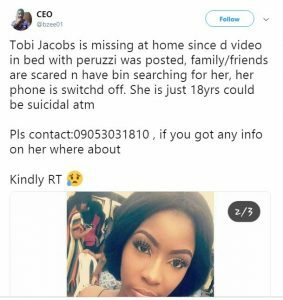 Twitter user, @bzee01, took to his page to share the news that the lady who he said is only 18 years old has gone missing after the video went viral. According to b, bzee01er, Tobi’s phone has been switched off as family and friends efforts to reach has prove abortive and he fears the lady could be suicidal at the moment. Pls contact: 09053031810, if you got any info on her where about. Kindly RT ?